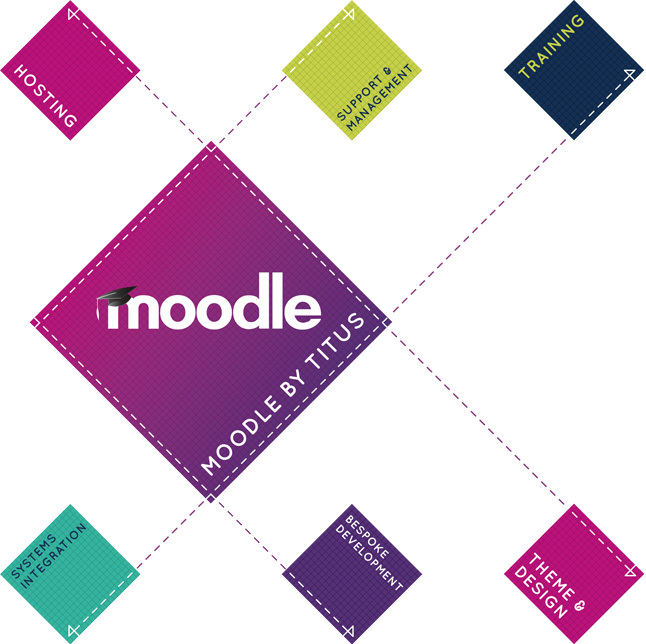 Titus Learning is a certified Moodle Partner providing smartly tailored e-learning solutions for schools & colleges, businesses and other types of organisation around the world. Our e-learning consultants are backed up by our team of in-house Moodle developers, designers and user experience (UX) experts. Our team members have been working with Moodle, and even contributing plugins and advice to the Moodle community, for an average of 10+ years. Get in touch for your free demo, or to chat with one of the team about your Moodle requirements. We handpick Moodle services to address specific e-learning requirements. From bespoke themes making Moodle effortless to use, to integration with other systems for saving valuable time, to custom development solutions – we ensure you get the perfect fit. Whether you’re hosting your Moodle on-site, or looking for a cloud based solution, we’ll ensure the infrastructure is a perfect fit for your needs. Our cloud hosting is built on Amazon Web Services, allowing us to offer elastic, scalable hosting, so you’re not paying for unused capacity when you don’t need it. Our team has Moodle experience across a range of organisations, regions, and skillsets. Your nominated support technician will proactively review your Moodle installation to ensure it’s meeting your needs, and will stay in regular contact. Trainers and educators are busy people – we save them time by creating intuitive interfaces that make day-to-day use of Moodle a straightforward process. We’ll weave together face-to-face training, online sessions and webinars supported by outstanding content. Our tailored Moodle platforms feature tight-knit integration with vital systems including student information systems (MIS) such as SIMS and Powerschool. Integrate with office software such as G Suite for Education and Office 365, CMS packages including Drupal, Joomla and WordPress, and a whole suite of others. With the Moodle core as a base, our development team have experience in creating Shopfronts & Payment Systems, CRMs, Assessment Tools, Event Management Systems and much more! Whatever you’re looking to achieve with Moodle, we’ve got the knowhow to take your idea from the drawing board to reality. Matched to your organisation’s branding, our bespoke themes work seamlessly on any device and can be accompanied by your own personalised Moodle mobile app. Designed to fit the end user perfectly – nothing is “off-the-peg”. Why not get in touch to see how our Moodle services can help you too?